I’ll be at Penshurst Farmers’ Market this coming Saturday cooking up lots of lovely dishes for visitors to try with Kieron from Kieron’s Game for our regular Game Day at the market. The recipes all come from my books and I’ll be signing copies – perfect Christmas presents of course! November is one of my favourite months as a cook – I love all the hearty flavours and warming dishes using the wonderful produce on offer at the market, and really enjoy introducing young and old to the delights of modern seasonal game at its very best. We’re also celebrating as we won the Best Kent Farmers’ Market in the recent Kent Life Food and Drink Awards 2015 so this is a great month to visit if you haven’t before to see just what all the fuss is about. The weather forecast is suitably mixed for Saturday so come prepared with stout shoes and macs, bags and cash and an appetite to try some great local food. I look forward to seeing you there. You can make it even more of a day out by visiting the Penshurst Vintage Christmas Fair taking place nearby in the village hall on Saturday. The clocks have gone back and it’s that time of year again when short days and cold nights mean we all crave a little comfort from the kitchen. Slow-cooked casseroles, satisfyingly starchy creamy mashes, rich flavoured roasts and warming puds all fit the bill perfectly. So wrap up, put on some sensible shoes and head out for a trip to your local market for inspiration. This is also the month to place your orders for Christmas treats to pick up at the December markets so go prepared with your shopping list to ensure you get just what you want. Root vegetables are at their tastiest now and perfect for mashes, gratins and roasts – they improve with the cold and you will notice a marked difference in flavour from locally sourced varieties compared to supermarket specimens. Look out for parsnips, Jerusalem artichokes, swede and turnips. Try cooking peeled, cubed celeriac with a couple of cloves of garlic in the cooking water then mash with a big dollop of locally produced butter to go with venison or roast beef. Main crop potatoes are full of texture and flavour and the varieties available in your own area are worth exploring. Ask the stallholder for advice on which potato to buy – the right one, floury or waxy, will make all the difference to the finished dish. The brassicas really come into their own this month too – kale, spring greens, Brussels sprouts and all kinds of cabbages are wonderful in stir-fries, soups, and hashes or just steamed with grated nutmeg and more butter! And red cabbage cooked with apple, spices and red wine is another seasonal treat to go with rich pork, or maybe a roasted wild duck. So local it probably walked through the market last week! Colder waters make for high quality fish and seafood, and as the temperature drops the range available just gets better. At the luxury end of the scale, treat yourself to the very best crab, lobster and oysters. For fish, Dover sole, turbot and halibut are rightly considered the very finest eating by cooks and chefs. But also this month why not try some of the lower cost alternatives as many are at their best. Brill is a real discovery if you haven’t tried it before – a firm white flesh full of clean flavour that only needs simple cooking. Or opt for healthy mackerel and herring, full of valuable Omega 3 fish oils. Shellfish including oysters, scallops and mussels are also all good this month. Spread the shopping load in the run up to the festivities next month and stock up on chutneys, mincemeat, jams and jellies along with goodies for the freezer to keep you going during the party season. Pates, Scotch eggs, pies, breads and cakes are made with locally sourced ingredients and will all freeze well, perfect for feeding unexpected guests. Apples are available in abundance this year so try as many local varieties as possible – Bramleys are perfect for using in mincemeat and Christmas pudding so buy them ready for stir-up Sunday at the end of the month. The eating varieties can also be used in tarts, puddings and cakes. 1 Peel the chestnuts. The best way to loosen the skins is to pierce each one with a skewer and then give them a blast in the microwave, doing about 5 at a time, on high for a minute. The skins should then peel away – if they don’t just microwave again in bursts of 30 seconds. 2 Heat the oil in a large sauté pan and fry the onion, carrot and celery together for 3 – 4 minutes until softened. 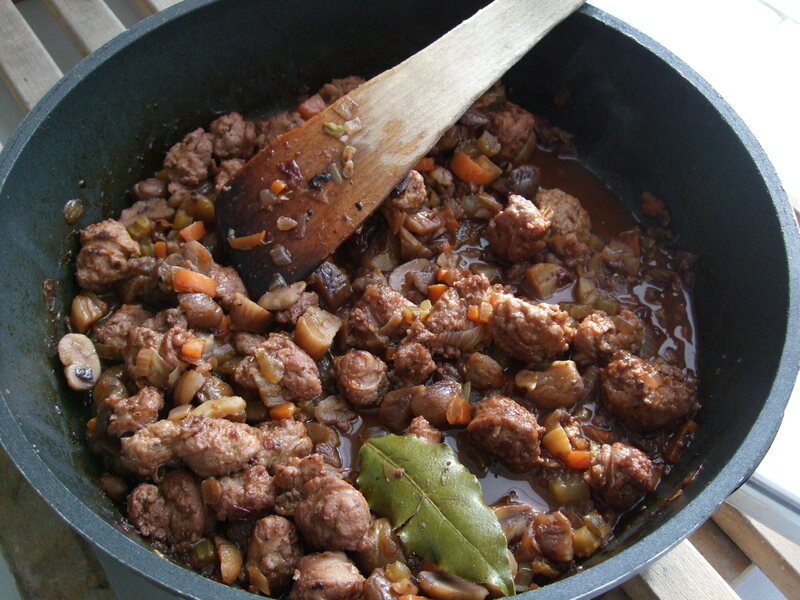 Add the sliced sausages and brown quickly over a high heat. 3 Stir in the stock, wine, bay leaves, chestnuts, tomato puree, cranberry sauce and seasoning and simmer, covered, for 15 minutes until the meat is cooked through and the liquid reduced. While the sauce is cooking, cook the pappardelle for 2 minutes in a large pan of boiling water until just tender. 4 Drain the pasta and toss with the sauce. Serve with freshly grated Parmesan Reggiano or a local hard cheese like Lord of the Hundreds. 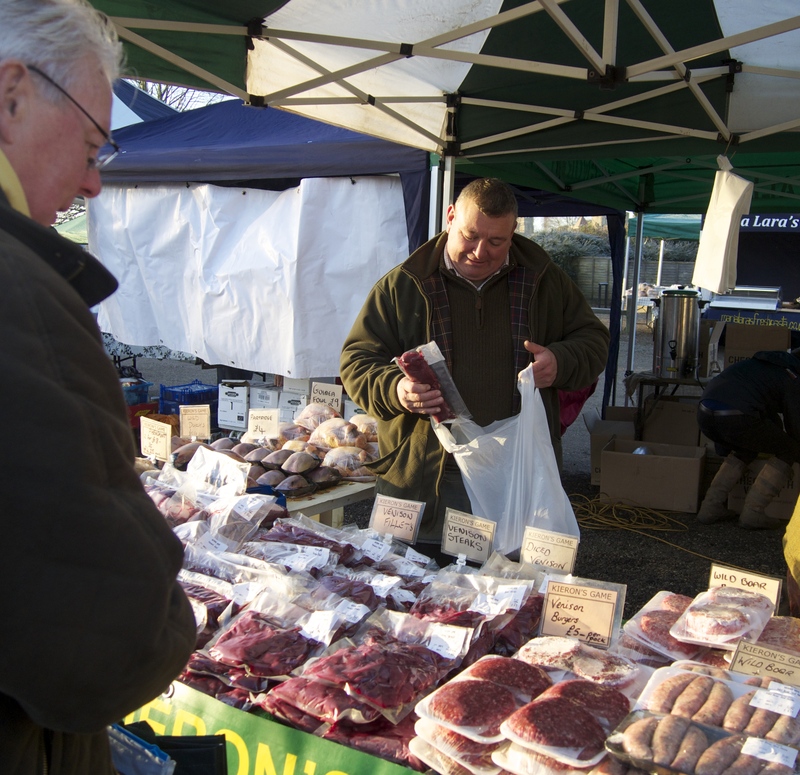 This entry was posted in Uncategorized and tagged game cooking, in season, Kent farmers markets, Kent Life Food and Drink Awards 2015, Kieron's Game, local food, Penshurst farmers market, penshurst place, venison recipe, venison sausages. Bookmark the permalink.